Summer Party Time is coming! "BROASTED CHICKEN" and Potatoes. We also carry homemade Coleslaw, Party Salads, Mostaccioli and Dinner Rolls. We can cater any size party for around $5.00 per person. Just go to the Party Planner Page on our website or call the store if you need any help with planning your menu. After 5 trips to Chicago and almost a year of research and development, I am truely satisfied that this pizza lives up to the "Father & Son" name. 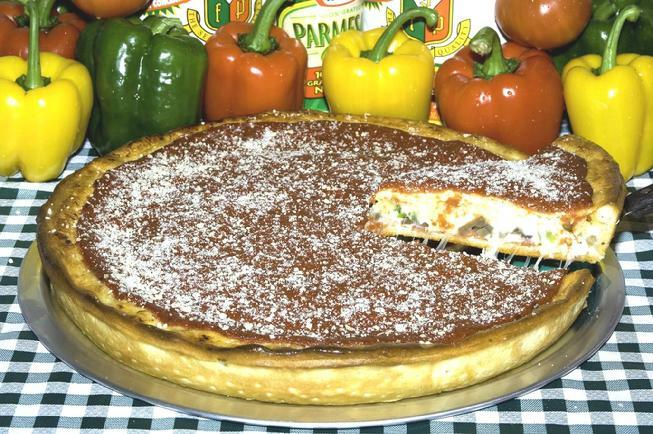 This authentic deep dish pizza pie features 4 classic Italian cheeses, along with your favorite toppings, stuffed between two layers of our delicious homemade pizza crust, smothered with a double portion of our famous pizza sauce. After baking, we brush the crust with garlic butter then sprinkle on the Parmesan cheese. This pizza requires around 35-45 minutes to prepare, but believe me, it is worth every second!